It is no surprise that this novel became a bestseller in France, as it captures a moment like a bird in flight—that sunny moment of refusing to acknowledge the weight of cares and celebrating the silly, the mad, and the wild. We are led in this madcap adventure by the irrepressibly sassy Garance, who travels from Paris by car with her brother and his wife to a relative’s wedding. Travelling wearing her thong because her skirt was too tight or slathering depilatory cream on her legs in the car (“Where else can I do it?”), Garance narrates, giving us a view of her family and their lives. 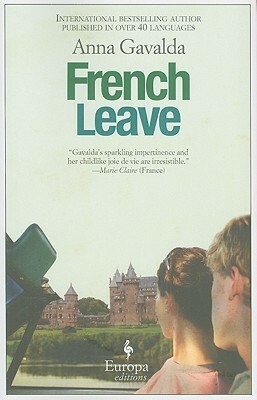 ‘French leave’ is a phrase meaning to take one’s leave suddenly, with no warning and without permission. And that is what a family trio does almost immediately after arriving at the wedding in Podunk-on-Indre. Suddenly deciding what they really wanted to do was to visit their brother in Tours, the siblings jump back in their car and race away to spend the day with each other, taking time to remember, laugh, love, and celebrate their bonds. Left behind were boring family obligations, spouses, painful responsibilities and what they enjoyed was joyous, rare, and life-sustaining. Something really must be said about novels that actually celebrate the ties between siblings. How rare it is. This paean to family life caused me to wonder about the parents: what had they done (or not done) to make the children so loving to one another? Sure, the kids are different from one another. Older sister Lola is careful and cautious, while younger sister Garance is completely at ease with seeing how much she can get away with. But the two somehow feel as though they are enriched—nay--can’t live without each other’s influence. Simon and Vincent are likewise different as chalk and cheese, but the freedoms of one nutures the other. There is admiration, support, generosity, and a depth of sincerity displayed that is usually reserved for best friends. This slim novel is just a weekend slice of life—but what a slice it is! This novel should be required reading for twenty-somethings on the cusp of discovering the "latter years" and those others who need the fizz put back in their drinks. Wonderful light summer fare. Debut novelist Amor Towles has captured a moment in the life of a woman when she was up for grabs—emotionally, spiritually, physically. 1938. New York. Two twenty-something women from very different backgrounds meet in Mrs. Martingale’s boarding house located on the lower East Side of Manhattan. They party by their wits and their beauty for they have no money. Together on New Year’s Eve 1938, they run into Tinker Grey, a wealthy enigma who becomes part of their lives. Lush, literate language channels the period: jazz saxophonists have a “semblance of rhythm and surfeit of sincerity;” Midwestern beauties are “starlight with limbs”; Indiana-born Eve Ross could be a “corn-fed fortune hunter or a millionairess on a tear.” Towles seems to really enjoy choosing words that express locales, movement, inflection. The language glitters, though the larger job—meaning—seemed to lack depth. Spring turns to summer and when autumn comes, our narrator Kate has compressed the usual time it takes to develop a grown-up sensibility, and has evolved into someone cautious, calculating, focussed. There were moments in this novel when I discovered I didn’t admire nor even like these people very much. I had a sense of distance from events, and meeting our narrator years later didn't reassure me that she'd developed whatever character or grace her younger self had lacked. This Books on Tape audiobook was performed by Rebecca Lowman with considerable skill. She may have made our narrator slightly colder than strictly necessary, but it was ably done. Author Haley Tanner nails young love and the immigrant experience in this debut novel about ten-year-old neighbors in Brooklyn, both from Russia, who come from very different family backgrounds. Vaclav and Lena form a strong friendship, and struggle to make their way in the new world in which they find themselves. Vaclav wants more than anything to be a magician, and he’d like Lena to be his assistant. The scene in which they discuss which clothes they will wear for their magic show is most poignant—he chooses shoes covered in tin foil (voilà: silver shoes) and she dreams of a gold-colored fringed bikini. This debut novel could (should?) really be classified as a teen title because it has all the ingredients, pace, and timing for a successful teen title, and is entirely appropriate for that audience. I believe it would receive attention and acclaim in that category. At first we see Vaclav and Lena at age ten, and their emotions and reactions are described in painstaking detail as they navigate an adult world in a new and confusing country. The adults are merely background to their blossoming confidence and coming of age. We see them again at age seventeen, and once again their feelings and reactions to the world are recorded faithfully. This book would be a useful and pleasing required read for high school students for a number of reasons. It is current. The language and descriptions are relatively simple and clear, and can show students (and teachers) interested in the writing process how descriptive passages, conversation, and storyline all work together to move the story forward and create a coherent whole. It is a coming of age story without harrowing detail, but with implicit sexual awakening. It tells of an immigrant experience that is both important and interesting to examine in a group. It is from the point of view of teenagers, both of whom become perfectly realistic and admirable human beings, despite the difficulties of their upbringing. Scott Alarik knows what every good novelist knows: readers want something real. And he delivers. The Boston folk music scene has never been so intimate. 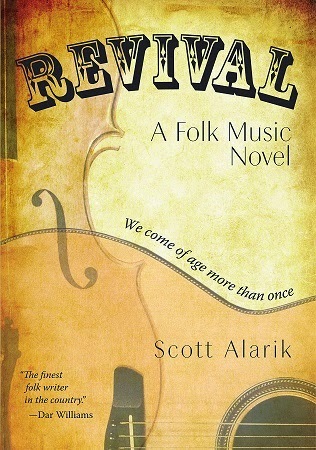 Alarik, former folk music critic for the Boston Globe, is a singer/songwriter in his own right, and with this debut, a novelist. We get the inside story on what it feels like to write music critiques for a major newspaper in this new century, but we also get a good sense of what it feels like to be a musician, writing songs, jamming late into the night. And Boston comes across so strongly, we can smell the streets and feel the weather. This story is told in the voice of a musician whose name is stored in the memory of folk aficionados, but who has not written a song nor toured widely for many years. He is handling open mike night and jam sessions at a neighborhood bar near Harvard Square in Cambridge, Massachusetts. He is remembered for his own songs, but also for his adaptations of old favorites going back through the centuries. He is also remembered, he fears, for the alcohol-induced slackness of the years after his chance to be a big name passed him by. He keeps his life limping along until a shy, young songwriter/musician comes into the bar one season and changes everything. A message that comes across strongly in this novel is the solitariness of creation. There is a necessary introspection to the creation of new (or modification of old) art and Alarik’s main character, Nathan, has it in spades. But community is necessary also, and that’s where we come in. We find here a map for creating community, a guide to the people you will meet, and an understanding of the various meanings of success. Alarik’s website gives his tour dates. You’ll want to listen to him after reading this book, I promise you that. The publisher sent me a copy of this book for review, and is offering one as a giveaway to readers of The Bowed Bookshelf! Leave a comment below with your email address by September 10, 2011 and I will use Random.org to choose a winner. You do not have to be a follower of this blog, but if you win, you will be contacted by email to get your mailing contact info. You will find Revival: A Folk Music Novel a fascinating meditation on music, art, and the meaning of mature love. A couple of years ago I wrote that it takes a brave man to create a novel that parallels and paraphrases the greats like Shakespeare and Dante. But Johnson takes it on handily: everybody in this new addition to his Sheriff Longmire series reads Dante—a paperback copy makes its way through backpacks and winter whiteouts to mountain peaks and cabin hideouts. It makes me want to go back and wrassle with The Inferno some more. FBI agents, Indians, cops, murderers and gang-bangers--everyone finds something in Dante to quote and apply to their own situation. It helps, I suppose, to have created a long-running character called Virgil, but Johnson also gave us a Beatrice. Perhaps Johnson is letting us in on his grand scheme when he created such memorable characters in the first place. There is a Homer, too. Homer doesn’t have a starring role, but comes back in with a refrain now and again—a friendly voice with words of warning for Sheriff Longmire who was tasked with turning over a group of misanthropes to a team of FBI taking them to jail sentences far from Wyoming. The turnover goes wrong, a winter storm closes the mountain pass, the convicts escape, and hostages are taken. Hell, it turns out, is not hot, but cold, just as Dante tells us. Johnson has created characters in this series that make one so glad that we have a west so very different from our eastern shores. Lawmen, Indians, horses, wild animals—Johnson makes trekking big mountains palpable, and we wish, really wish, that we could actually meet people with such depths of compassion and friendly openness as we meet in his books. In this way, he reminds me of Maeve Binchy, who is one of the greats for translating everyday life into conversation. Both Binchy and Johnson write fiction that hints at romance, simply because we know it cannot be true, or real, but we wish it were so. Would it sound silly if I said he makes me proud to be American? Proud, not in the political sense, but in the sense that he has created people and a place and a history that I am glad I can claim is at least partly mine, if only because I am American, too. And I can go to Wyoming whenever I want. I listened to this audiobook with great pleasure. Narrated by George Guidall, it seems a perfect vehicle for his voice. The reading is a perfect pairing of great writing and great reading. I bought this book years ago because I couldn't resist it. It has gorgeous ideas for making detailed and highly structured quilt blocks--something I don't usually do. There is something calming about structure. Somehow, underneath all the flow that is my usual style, I must be a highly formal, structured individual. Scratch that. Clearly delineated lines give me something to work within. It works with gardens. It works with food creation. It works with quilts. And already, looking over this book again with an eye to the new indigo-like shashiko-looking fabric I found while at a world quilt show last week, I have already begun to see how I would modify the structures to retain the sense, but not the look of the originals. This stuff is really gorgeous, don't get me wrong. But it is not me. That's probably a good thing. Now, this book: It has detailed instructions on completing some real stumpers: inset seams, triangle squares, and special piecing techniques are all explained. Color pictures, and enlargeable diagrams are included. I don't think there is anything she missed. It is a spur to creativity, and an aid to completing one's vision. If it isn't exactly what I need, that is probably because she's written another book that probably covers what I think I need: Japanese Taupe Quilt Blocks: The Calm, Neutral Collection. I'll have to get it and find out. Briscoe did a brilliant job on this series. If you haven't created something wonderful from these books, you probably haven't tried yet. How can a book be hilarious and heartbreaking at the same time? In Jane Gardam’s hands, this epistolary novel never takes a pot-shot at anyone (without good cause), but becomes increasingly specific, focusing especially on how women of a certain age manage their falling-apart lives. All kinds of lives are looked at: those who left; those who stayed; those who worked; those who did not. There is a distressing yet comforting sense of being a victim at a disaster, being looked after by those very same women of a certain age, all of whom have seen your life and others far worse—their own, perhaps—and who are willing to wrap their experience and compassion about one like a newly-sewn quilt, beautiful and awesome, and sometimes painful to behold. Why painful? Because of all the work, mistakes, choices, energy that goes into making a quilt. Sometimes it’s a success, sometimes it isn’t. But sometimes we won’t know this until it is done. This book is also like a quilt, in that set pieces are created, and we laugh with jollity at the cleverness of the creation. When, finally, the time comes to stitch the pieces together, the whole suddenly becomes something else altogether and we stand mute at the meaning and magnificence of what Gardam has managed to do. Our narrator, Eliza Peabody, begins to write letters to Joan, the woman living down the street. Eliza does not know Joan very well, but has come to have opinions about her, and feels it quite within her area of expertise to offer advice on her marriage, on her state of wellness, on her husband. She begins broadly, with two paragraphs one February, signing it Eliza (Peabody) and progresses, with increasing familiarity, through “Your sincere friend,” and “Your affectionate friend,” to “E,” and finally, dropping the signature altogether. The letters become much longer and more intimate. Joan, meanwhile, leaves the country and never responds to Eliza over the years of the correspondence. What we learn about Eliza, then, is all there is. She is generous, thankfully, for it is her perceptions that guide us through the lives of her neighbors, her husband’s infidelities, her own housekeeping failures. She makes us laugh, cry, and beg for mercy. She makes me realize that Jane Gardam should be a household name and celebrated widely throughout the world. She is a national treasure. Nowadays I stop at every Borders Bookstore I pass, just to see if there is something there I need. I never come away empty-handed. I went in to a smallish store today on the off-chance they'd have something I was specifically looking for but no...what they did have was a selection of Europa Editions that were not on my to-read list, but which, when I perused them, look like "my kind of book." I really have no extra cash at the moment, but thought, in the spirit of looking for enlightenment, I really should take them home. And so...I did. Watch this space for reviews forthwith. This was a bestseller in France and I read it when it came out in English ten years ago. Many hundreds of books later, I still remembered the thrill I had at the risk the author had taken with her unusual murder mystery centered around a blind mute quadriplegic. I know, I know, how can this be? It was almost as if the author, sitting around with friends over several bottles of good wine, had taken a bet to see if she could construct a story about the most unusual of protagonists—one that cannot move nor see nor speak. I searched for the title again, and decided to have another look…just to see how the author constructed the mystery and how she kept the tendrils of the mystery in my brain after so many years. The voice of Elise, our narrator, is so piquant and particular that we follow her willingly through a series of grisly murders. We think also what it must be like to be handicapped so completely, and how other people relate to the handicapped. These things alone make the book worth reading. The central mystery itself is impossible to foretell—I defy anyone to figure out the ending in advance—but the ending is not as cleverly wound up as the beginning is laid out. The facts of the mystery are this: over a period of several years, young boys are found murdered and mutilated not far from a quiet suburban French village. Elise, blinded and paralyzed as the result of a bombing in Ireland, is befriended by a disturbed young girl who whispers to her that she knew who killed the boys. Unable to speak, Elise can only listen and postulate about the identity of the killer as more clues accumulate. Another child is killed, and Elise herself becomes a target, but even she does not know why. I think the author, Brigitte Aubert, deserves kudos for maintaining momentum through this novel, and for trying something completely new. As I say, it is difficult to get this book out of your head, so if you try it, be prepared to find yourself thinking about it for years. After its success in France, the author apparently wrote a follow-up novel which was also translated into English, called Death from the Snows, also with Elise as a main character. I haven’t read this one yet, but I am interested to see how the author proceeds with a new mystery involving our unusual heroine. Brigitte Aubert is a well-known thriller writer in France, but only a few of her many books have been translated. While this book has flaws, it is remarkable and memorable. Jansson captures not only a season but life itself with this short novel of a grandmother and her granddaughter summering on an island in the Gulf of Finland. The freshness of spring turns to the muggy veil of summer, and when August comes, our feelings of ending and loss are those we experience every year in this month. The characters in this book for adults, however, are not “cartoonlike in their simplicity.” They are rich with feelings of anger, spitefulness, tiredness, boredom, as well as joy, happiness, pleasure, and love. The grandmother can be crotchety to the point of sharpness, and little Sophia surprises us with adult words and emotions newly learned. But the two feed each other’s imaginations: they create a sea-side Venice, furnish a magic forest, and set off in journeys of discovery. Together they create a world neither would give away for any other. A friend has shared a website on Tove Jansson with essential facts and pictures. She was Finnish, born in 1914 and died in 2001. She was born into a warm, open-hearted home in which both parents were artists and storytelling was prized. She became a painter and writer. In another blogpost, we get pictures of Tove Jansson’s mother with Tove’s niece, Sophia, and the picture makes the entire book come clear. This is a wonderfully atmospheric story that will allow you to experience summer at any time of the year. The excitement of discovering this book was one I have not felt for years. It is all the things great literature should be: it shows as well as teaches; it is recognizable but fresh; it is on some level profound; it is memorable. The book is written in dialect, and it was a revelation to me to see phrases written down that I’d only ever heard. It added much to the general impression of the first section of the book as a stage play. And a wonderful, rich, funny, tragic stage play it would be. “We brought out the potential in each other.” This is the way I always thought love with another person could be—a state where one is something more, something better, when the other person is by one's side. The story takes place in Trinidad over a period of fifty years. Sabine and George come as representatives of a British shipping company, and find a way to live and love through the rise and fall of politicians promising more for locals, less for foreigners. Monique Roffey is not really a newcomer: this is her second novel, which became a nominee for The Orange Prize, one of the United Kingdom's most prestigious literary prizes, annually awarded to a female author of any nationality for the best original full-length novel written in English, and published in the UK the previous year. Roffey’s first novel, Sun Dog, was published in 2002 by Scribner. Sun Dog, set in South America, employed magic-realism, and was warmly received by critics. My guess is that it may show us the early promise of this accomplished novelist. Reginald Hill is in a class of his own. His mystery series featuring Dalziel “the fat man” and Pascoe is a long-running masterpiece of British humor. 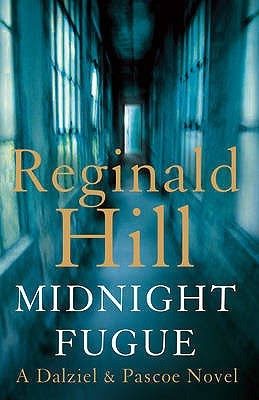 Hill populates the series with many characters and much activity, but exhibits masterful control in keeping everyone doing…the wrong thing. Once again Dalziel manages to extricate himself from an ambiguous-looking situation that would be career-ending for anyone else, and comes up accepting kudos from his coworkers—all except Pascoe, who thinks Dalziel might just as well retire before he does them all in. Dalziel knows he is not long for the force, but decides to hang on for the sheer cussedness of it, and the pain he knows it gives those who long to take his place. I did not read the series in order—Hill was incredibly prolific, and had written 24 books in the Dalziel and Pascoe series. In this novel, we learn that Dalziel has survived a bomb attack previously and is back on the job a little worse for wear. He has forgotten which day it is and ends up driving madcap to work early on a Sunday morning. Just as well, since he has two cars following him which he needs to sort out before he gets back into the maelstrom that is work. Dalziel is a “fat man,” but what we love about him are his appetites. He is enthusiastic, wily, generous, experienced, and has this case figured out long before he can prove anything. Hill even lets us into the secret, knowing full well that we have no way of uncovering information before he decides to share it with us. We love Dalziel because he is so much more incorrigible than we would ever allow ourselves to be, but he is that rare creature that always knows what justice is. We can reliably place ourselves in his hands and know that he’ll work out whatever trouble we face—though not without a few bumps and scrapes along the way. I listened to the audio version from Whole Story Audio Books, and thought Jonathan Keeble did a brilliant job of the reading by distinguishing characters by accent, and giving the whole a perfectly comprehensible pace.